The Zen Hale is the perfect home base for your exploration of the Big Island. We are conveniently located on the sunny side of Waimea Town only a 10 minute drive to the best Kohala beaches and minutes from HPA. Our convenient central location is ideal for setting out on day hikes or exploring all the sites on Hawaii Island. The unique serenity of this one bedroom, one bath cottage offers ocean and mountain views enhanced by cool breezes and mild temperatures. The kitchen is fully furnished with full size refrigerator, large convection/toaster oven, microwave and a 2 burner state of the art induction cook top. Luxurious linens adorn the separate bedroom and a beautiful stone shower appoint the bathroom. Use the gas BBQ outdoors to prepare the local foods purchased at the farmers market then relax while viewing the blanket of stars. A separate laundry room with washer and dryer is available for use and laundry detergent is provided. You will find yourself minutes away from the best beaches on the Big Island. The largest of Hawaii Island’s white sand beaches, Hapuna Beach, has consistently been rated on numerous international Top Ten lists. Mauna Kea Beach, a perfect crescent of golden sand leading to calm water, has been voted among the Top 10 beaches in the U.S. Both offer great conditions for swimming, sunbathing, bodyboarding and snorkeling. Beyond the beaches, Hawaii offers a host of outdoor activities and sightseeing opportunities. Head to the Paniolo Town of Waimea and visit the many shops and galleries. From there is the perfect starting point for a trip to the Volcano National Park or a glimpse of the stars and planets at Mauna Kea Observatory. There's no better way to experience the amazing cultural diversity of Hawaii Island than to visit one of the farmers’ markets that take place all around the island. You’ll find fresh, locally grown fruits and vegetables used in Hawaii Regional Cuisine, exotic varieties that are as intriguing as they are tasty plus an eclectic collection of prepared foods.The market is also a great place to pick up handmade artwork or a unique gift and strike up a conversation with the artist who made them. Let us know if you will be celebrating a special occasion or have a certain need. We will do all we can to accommodate your request. You will always feel welcome and long to return to our unique retreat. If the calendar at the Zen Hale is full, please contact us as we have other beautiful homes that may be available for your desired dates. •	Bookings canceled at least 60 days before the start of the stay will receive a 100% refund. •	Bookings canceled at least 30 days before the start of the stay will receive a 50% refund. 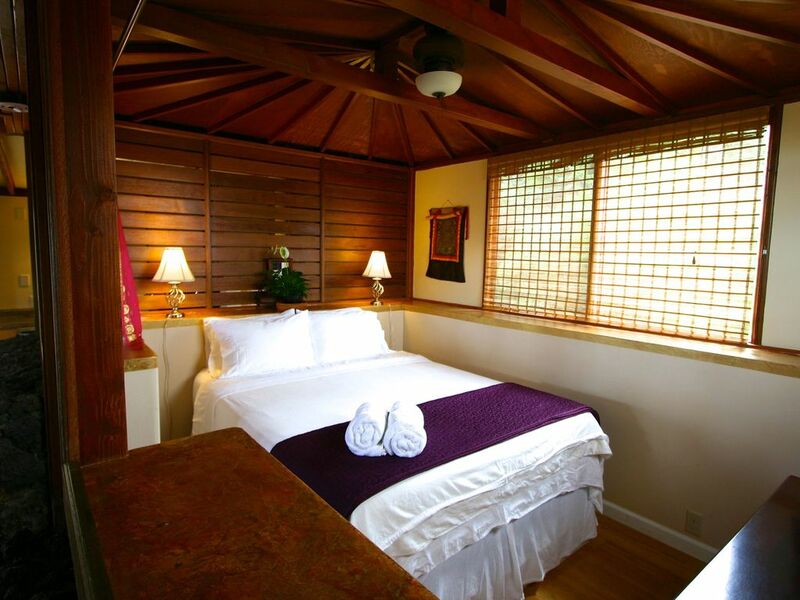 We chose our property for the excellent climate and the proximity to the best beaches and easy access to Waimea town. We have State of the Art High speed Wi-Fi Fiber optic internet service that runs @ 1 GB speed. WI-FI SENSITIVE PEOPLE: For those of you with Wi-Fi sensitivities we have personal routers and router tamer bags with an on/off feature. We also have ethernet ports for hardwire connection. There is no better place to take a nap in the afternoon or enjoy an evening of star gazing. Our elevation of 1700' provides breezes and milder temperatures and the perfect culture for organic farming. We're very pleased you enjoyed your stay at Zen Hale and all the amenities provided. The additional outdoor shower is a great place to enjoy the nightly star show! Thank you for your review and we do hope you'll return for another Hawaii Island adventure. Rural paradise with easy access to Kohala beaches and Waimea. Zen Hale is at 2000 feet so night sleep is wonderful, the stars are stunning. Best beaches just ten minutes by car. All went very well. It is a new feeling cottage, nice design, private, the outdoor shower is fun. It is convenient to both Waimea and the Kohala coast. Matt was very accommodating. It was great to find beach chairs, boogie boards, a cooler, beach towels, and an umbrella there for us to use. We couldn't bring that stuff from the mainland but it is essential for the beach. We're so happy you enjoyed your stay at Zen Hale. We have worked hard to make it a private and serene space with everything you need for your stay. The outdoor shower compliments the regular indoor shower and is really a treat for evening star gazing! We were happy to provide everything you need for a day at the beach. Thank you again for the opportunity to be your hosts. We hope you will visit again soon. Amazing stay at Zen Hale. A perfect peaceful getaway retreat. Nice touches with BBQ, outdoor shower and beach amenities. We're happy you enjoyed your stay at Zen Hale and took advantage of the amenities we offer. Thanks for being such a great guest. You'll always be a welcome guests and we hope to see you on your next Hawaii Island adventure. Perfect location for our Waimea visit! We stayed here for a week and our visit was just about perfect! The cottage very centrally located, about 10-15 minutes from the beaches and <5 minutes from Waimea. It is private, but has a beautiful view of the Kohala hills and for the sunsets. Matt was very helpful, being there when our plane was late, to help us find the cottage. The cottage was well laid out and the bed was very comfortable. The ceiling fans and portable fans were a nice touch. We like to walk and there were several nice roads to walk on with little traffic. I liked the way the place was set up - private, but not confined. Our favorite feature?? The outdoor shower! It is private, but there was something refreshing taking a shower in the sun with a gentle breeze! This was a perfect "10" in our book and we plan to come back!! Thank you for the perfect "10" review. I am so pleased that you enjoyed your stay at Zen Hale and all the amenities that we strive to provide our guests....Mother Nature takes the credit for the beautiful area of Hawaii Island but I'll take credit for the outdoor shower. You'll always be welcome guests and we look forward to hosting you again anytime. Thank you again for your reservation and this opportunity to be your hosts. Waimea, also called Kamuela, is the largest town in the interior of the Big Island, and is the center for ranching activities and paniolo (Hawaiian cowboy). This historic area full of rolling, green pastures is still home to cattle, cowboys and ranches. The Parker Ranch in and around Waimea is the largest privately owned cattle ranch in the US, and the annual Fourth of July rodeo is a major event. But there is more to Waimea than just paniolo. This area is now home to a thriving community. You’ll find one of Hawaii Island’s finest chefs at Merriman’s Restaurant. Peter Merriman is three-time finalist in the prestigious James Beard Awards for Best Chef and is one of the founding members of Hawaii Regional Cuisine. You can also find the Kahilu Theatre here, a 490-seat cultural mecca on Hawaii Island featuring performances by renowned musicians, dancers and artists. The Waimea Cherry Blossom Heritage Festival, held annually in the first week of February, has recently become another major event of the town. In the center of town you can find Hawaiian art at the Isaacs Art Center and the Wishard Gallery. To explore the road less traveled, the Kohala Mountain Road (Highway 250) leads north from Waimea to the charming town of Hawi. Most visitors miss this beautiful drive, but it’s a scenic way to get from Waimea to Hawi and the stunning Pololu Valley Lookout, which showcases breathtaking coastal views of the Hamakua Coast.